*Last year there was a theory that large numbers of icebergs in 1912 were caused by a rare celestial alignment. The theory, such as it was, received a yawn from the Titanic community. It does not matter whether the icebergs in 1912 were caused by a celestial alignment, a warmer current, or perhaps Marvin the Martian playing with his weapon on Mars. Titanic struck an iceberg because a lot of things went wrong. There was complacency of all kinds from the Board of Trade to Captain Smith deciding to speed up Titanic on a cold, moonless night through an iceberg field. 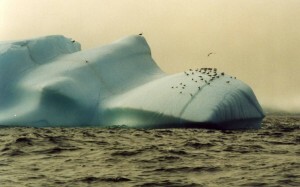 Now researchers at Sheffield University disputes there was an abnormal amount of icebergs in 1912. They claim there was a “raised iceberg hazard” but it was not exceptional. But hold on because they claim that now it is much more dangerous because there is more ship traffic in the Arctic. And this means more iceberg incidents will occur. Well of course if your are moving through areas where icebergs normally float around in, the possibility of hitting one is not remote. Easy to avoid the ones that can be seen but no so the ones just under the surface or getting to close to a berg that has a much larger base underwater than can be seen. 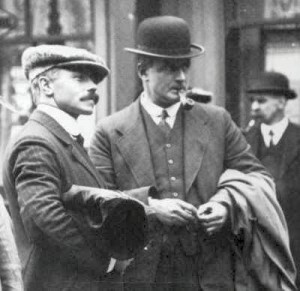 Lightoller, right, with third officer Herbert Pitman. Later thanks to survivor accounts and witness statements at American and British inquiries, we learn much more about what happened. The insurance company–Atlantic Mutual–had to determine whether the loss was covered or not. Were the officers and in particular Captain Smith negligent in full or in part for what happened?If they denied the claim arguing Smith was negligent, they would have to prove that in court. Who handled the ice warnings and why were they not plotted out? Those and other questions would have to be answered in court. Did Smith know the danger or did one of his junior officers fail to inform him? Get the picture? It would be difficult to prove in court whether Smith was really at fault or one of his junior officers. You could argue indifference or complacency but it would be a long legal battle that might take years to resolve. They choose to pay likely because it would cost more in the long run to litigate the matter and end up paying more in the end. Did Lightoller cover up for Smith or other officers who did not properly plot out the ice field from the warnings received? Possibly but the statements given in the document are factually accurate and meant to neither overplay or underplay anything. Just the basic facts, to paraphrase Sergeant Friday from Dragnet. Atlantic Mutual paid out £3 million (one news report said Titanic was insured for $5 million). When Titanic was discovered in 1985 and later a salvage award was issued, I believe they or a successor company put a claim in with RMS Titanic, Inc. A settlement was reached and the amount paid to them confidential. *The Titanic Effect is something I call that happens when people recall other maritime disasters that are less known. Consider what is called “Minnesota’s Titanic.” On 13 Jul 1890, a paddlewheeler called Sea Wing was smashed by a wave and turned over killing 98 people (mostly teenagers and young adults). Ben Threinen and Fred Johnson are preparing a documentary about this tragedy so that people remember what happened. Most are stunned when they learn of it says Johnson. And properly so. *Dr. Paul Lee is involved in a new project called Titanic Global Database. 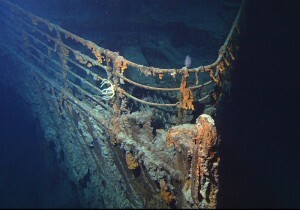 He is collecting locations “relevant to the Titanic society as an aid to researchers and tourists. ” He plans to add new locations each week but the project is huge and is just starting. You can visit his website at paullee.com. *With another anniversary of Titanic’s sinking nearly upon us, I always take out two videos to watch. One is the 1958 movie A Night To Remember (based on the excellent book by Walter Lord). Although it was made long ago, it still does the story right and never fails to entertain. Another is the excellent A&E documentary which goes through everything with interviews from survivors, researchers, and others. And it is narrated by David McCallum (Ducky on NCIS) who played Harold Bride in the 1958 movie. Amy and Samy Outside Restaurant. *Kitchen Nightmares is back! Once again we find out how bad some restaurants can become and in dire need of Gordon Ramsay’s help. Of course the season could not start without first going over what happened at the now infamous Amy’s Baking Company. It was the rare episode in which Gordon realized there was nothing he could do since Crazy Amy and Samy The Hammer were totally in denial about what was wrong. They were not interested in anything Gordon had to say or suggest. And America saw two people who either were the greatest actors of all time or truly crazed. The Internet went wild and so did they in responding. From what I saw, it looks like they have not changed much and in fact angrier than before. Now they are making wild claims that Gordon Ramsay sexually harassed Crazy Amy. They make this claim in a video and are declining to take it down despite threats from Fox and the production company. You can view the video at Radaronline. However on their recent appearance on Dr. Phil, they did not make this claim. **Links to Republic of Ireland newspapers are not provided due to pay for links policy.